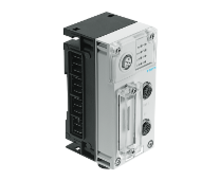 The pneumatic valve system series AV from AVENTICS offers the ideal control center for pneumatic applications with it’s broad functionality, modularity and small dimensions. Via the integrated Advanced Electronic System (AES) full functionality is also available via POWERLINK. 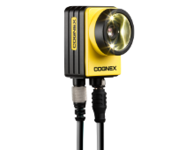 In-Sight® 7000 series of Cognex completely integrated smart cameras feature autofocus, fast image capture, integrated lighting and lens with powerful vision tools for inspection, color, OCR applications and more. They also have the capability to power and control a range of external lighting—all in a compact, industrial IP67 package. 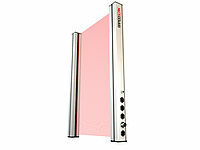 DATALOGIC SG4 FIELDBUS is the first safety light curtain with integrated openSAFETY protocol over POWERLINK. Finger, hand and body protection safety light curtains are integrated in a seamless network with safety controllers, sharing advanced diagnostic and safety functions like muting and blanking. The RapidoScan is by far the fastest light curtain measurement system available on the market today that needs only 5µs to process an individual beam. It has a very high resolution of 2,5 mm and is optimally suited to the detection of transparent objects. With a directly integrated POWERLINK real-time interface (including a built-in dual port hub) all measurement data can be output to the control. The RapidoScan can be ordered in lengths from 160 mm to 2,000 mm in steps of 160 mm. 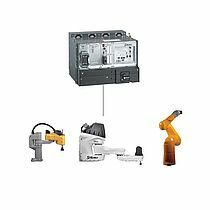 Ideal scenarios include fast trigger applications, detecting very small objects even at high speeds and precise object measurement. In some applications a camera system can be replaced. The new generation of POWERLINK encoder is based on a FPGA solution. The same design has been achieved at almost the same cost as the Fieldbus design. This new platform is introduced with the Powerlink interface. The connection cap (IP67), as an integral part of the encoder provides a reliable connection using standardized M12 connector. Two externally accessible hex-coded address switches, which also offer IP67 protection, allow an easy adjustment of the host ID in the Net ID. This reduces maintenance and simplifies installation for the network administrator. With the integrated hub and thanks to extremely short delay times even longer line structures can be implemented. The diagnostic LEDs indicate the status of traffic or link to the respective port connection and the network status of the device. Cycle times can be up to 400 µs or reach with a low asynchronous data traffic up to 240 µs. Besides the classical polling mode, in which the master (Managing Node) polls each slave (Controlled Node), the POSITAL encoders support the modes "Poll response chaining" and "Poll multiplexing". This expansion of the operating modes allows the customers to implement the new interface design efficient to custom applications in time-critical areas and increase the bandwidth significantly. The encoder profile DS-406 CANopen has been ported to POWERLINK. Slip Rings are used wherever electric currents, signals or data need to be transmitted from a stationary machine element to a rotating shaft or vice versa. The ROTOCAP with contactless capacitive data transmission is used wherever high data rates such as POWERLINK must be reliably and safely transmitted. In combination with our contacting slip ring tracks, which are used for the power supply of the ROTOCAP, we offer you a complete system. Besides a wide range of standard designs, individual solutions are available that are optimally adapted to your applications and installation conditions. Automated format changeover with modularity and condition monitoring. 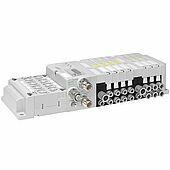 The 3-series of halstrup-walcher positioning systems has been designed for three relevant protection classes: IP54 (PSE), IP65 (PSS) and IP68 (PSW). All these actuators do not need an additional bus distributor because bus communication is integrated directly on board. LCBPOWERLINK digitizer, suitable for use on analog load cells or strain gauge sensors, even existing ones, is able to transform any analog load cell (mV output / V) into a modern POWERLINK Digital Load Cell. Thanks to this innovative product, LAUMAS is now able to provide the full range of load cells in digital version, which can interface with any PLC through POWERLINK. The TLB-POWERLINK is a weight transmitter OIML R76 and R61 (M.I.D.) approved. Compact, fitted with a display and keyboard for the calibration of the weighing system, a basic user friendly software and an POWERLINK output is suitable for any industrial automation. The TLM8-Powerlink is a weight transmitter OIML R76 approved. With 8 independent reading channels, max input 7mV/V, integrated digital equalization and diagnostics, a backlit graphic LCD display and a keyboard for the calibration, a user friendly software and an Ethernet-Powerlink controlled node. Temposonics® R-Series sensors with Powerlink interface are going to enhance the MTS portfolio of absolute position transducers for real-time measurements. Position and velocity feedback can be provided for up to 4 positions to ensure superior control even in driving complex, multi-position tasks. The sensors can easily be integrated into networks without further programming requirements. The PLC identifies the sensor by means of XDD files and accesses its parameters as needed. Diagnostic LEDs in the sensor head provide service personnel both visual Ethernet communication status and sensor operation. Different sensor designs are available for a wide variety of applications. Absolute rotary encoder with an ETHERNET Powerlink interface. Housing in the industrial standard with a diameter of 58 mm. A maximum resolution of 16-Bit is available (65,536 steps per revolution) for the single-turn version. 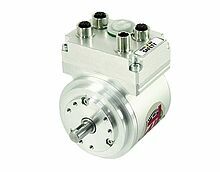 The user has the option to choose between a version with servo-flange or clamping-flange. The system address can be adjusted via the bus cap – supplied with M12 plugs. This absolute rotary encoder has an integrated webserver. A maximum resolution of 30-Bit is available (65,536 steps per revolution with 16,384 revolutions) for the multi-turn version. The user has the option to choose between different versions with recessed hollow shaft. The RS25 can be used in various print mark processes and the fiber-optic ATEX certified version is ideal in explosive gas environments. The sensor has extremely low jitter in combination with fast communication via EthernetPowerlink, resulting in a very high repeatability. The multicolored LED is adapted to each mark to get the best possible contrast. Linear absolute position sensors LA series are available with ETHERNET POWERLINK interface. 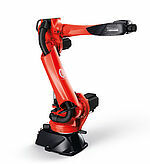 Positions and movements are sensed long term without wear due to the touchless measurement principle. The sensor cycle is fast enough to be integrated directly into closed loop position controls – and due to ETHERNET POWERLINK as well in distributed systems with centralized, PC based control technology. Change of sensor element is possible with the separated hull tube that can be obtained as an option. Measurement range is available with up to 4 m. Types in profile housing is available. Absolute multiturn rotary Encoder with redundant detection, certified for applications according SIL 3 and PLe. Resolution 8192 Steps per turn, 32768 turns absolutely detected. Safe position and speed information is transmitted via Powerlink with OPENsafety. Communicates directly with safety-controllers, no separate detection box requested. Addl. Incremental Interface (without SIL classification), Square or sine/cosine for local Motorfeedback. 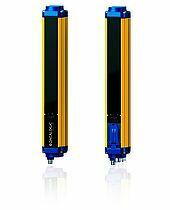 Mechanical speed up to 6000 1/min (solid shaft). Anti-turn lock by slot and key. Addl. types: CDH 75 M EPL with hollow-through shaft (anti-turn lock bey keyway). Optional housing made of stainless steel for food and beverage industry. Protective housings for explosive atmospheres (Zone 1/21 or Zone 2/22) on request. Absolute multiturn rotary encoder. Resolution: 8192 steps per turn, 256000 absolute detected turns. Programmable according to CiA DS 406. Cycle time typ. 400 µs, maximum rotary speed (mechanic) 6000 rpm. Also available: COV 65 M with up to 262144 steps per turn. 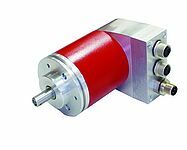 Absolute rotary encoders in size 58 are now available with POWERLINK. TR-Electronic is at the forefront again, when it comes to supporting your communication networks and controller families. With modern Industrial Ethernet systems, the rotary encoders deliver the necessary actual values so quickly that even axis control over the network is not a problem. The speed requirements of the respective control systems are fully met. 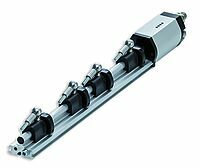 With solid shaft and blind shaft, the 58 mm series can be adapted to different machine configurations. In addition to the usual synchronous and clamping flange configurations, different versions are available as standard. TR-Electronic can also provide suitable shaft and flange combinations in inch-based dimensions for the US market without problem; UL listing is optionally possible. In the CEV58 and CES58 the resolution per revolution is 32768 steps (15 bits), and 256000 revolutions are detected without batteries or counters. The COV58 and COS58 offer a higher resolution, with up to 262144 steps per revolution (18 bits). The output resolution in the POWERLINK network can be parameterized with adjustment to the respective application. The M12 plugs are axially arranged, so that the connector cables do not protrude beyond the flange diameter of 58 mm. Two bus connections with an integrated hub support the direct linking of POWERLINK nodes in a line topology; just like the customary wiring in the field. 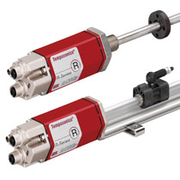 Further products from TR-Electronic with POWERLINK are non-contact and wear-free linear measuring systems, which e.g. 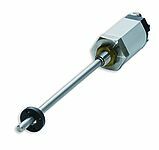 can be integrated directly into hydraulic cylinders in a flameproof design or can be mounted in or on machinery, thanks to their profiled housing.